“All Ninjas hate fruit. Swipe them with your finger to end their journey.” With those introductory words from Halfbrick Studios, I knew that Fruit Ninja was everything I expected, feared, and hoped it would be. Refreshingly simple and oddly addictive, Fruit Ninja is a bargain at $.99 and a must-have for every iPhone and iPod Touch gamer. Who knew avenging yourself against produce could be so much fun? These pieces of fruit insulted my honor. Now they must die. 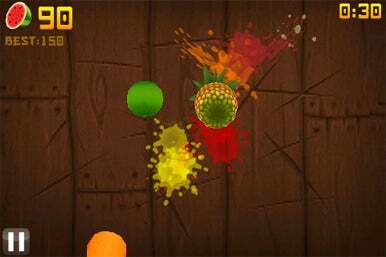 In Fruit Ninja, you get to slice a diverse array of delicious fruit flying across your screen. This is no cooking game. This is a Kill Bill-style pulpy fruit massacre. Simply slide your finger across a fruit mid-flight and HI-YA! Fruit slices and a juicy splatter indicate that your fruit foe has been vanquished. While the graphics are fairly cartoony 3-D renderings, they're fun and fit with the overall feel of the game. The game has two modes. In classic mode, you slice everything from coconuts to kiwis to watermelon while avoiding sizzling bombs. Combinations of fruit in one fell slash can bag you extra points. Watch out, though. You only have 3 lives, and once you let three uncut fruit drop off the screen, the game is over. In zen mode, there are no bombs and no penalties for dropping uncut fruit: you can just concentrate on slicing major fruit combos with samurai steel. Both modes allow you to post high scores on OpenFeint, a popular gaming network. With beautifully rendered graphics, some pretty sweet sword options, and innovatively simple gameplay, Fruit Ninja is a great game for all ages and all types of users. Now stop bothering me, little reader-san. I have some fruit to cut.